From Memphis, Tennessee, Clear was a highly touted 4-star recruit by Rivals.com (No. 169 overall) and Scout.com (No. 9 overall). After spending a season at the University of Tennessee, Clear decided to transfer, and wound up finishing his college career with Coach Kevin Sumlin, Johnny Manziel, and Texas A&M. The 6’6″ Tight End/Offensive Lineman never posted eye-popping statistics, but became a valuable contributor in his 23 games with the Aggies. His signature moment was a touchdown grab against the then-top-ranked Alabama Crimson Tide. Despite going undrafted in 2015, Clear signed a free agent contract with the Pittsburgh Steelers, who were enamored with his size, blocking abilities, and untapped potential. In 2016, he signed on with the Indianapolis Colts. In 2018, Clear will join The Spring League to work out as an offensive lineman. 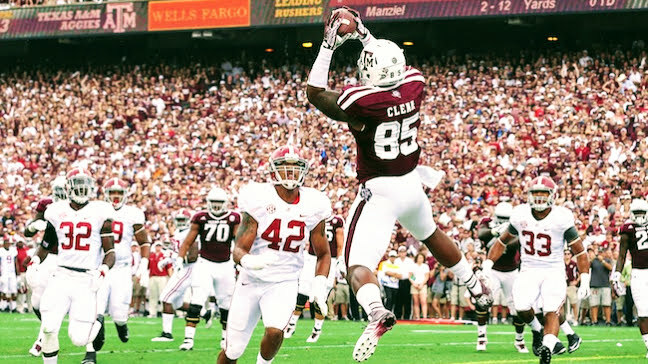 With his elite size and athleticism, Clear could seriously impress some NFL scouts with his versatility.